The index opened flat and went on to make days high within the first few minutes, but profit booking saw the index close weak at 8629.15, loss of 37.75 points. The broader market was weak with 699 advances to 902 declines. Range stays at 8500-8800. 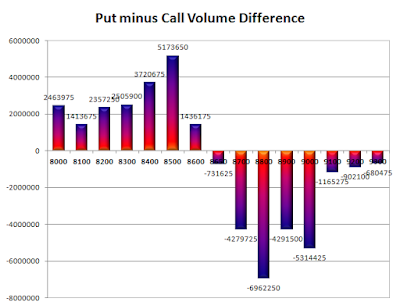 Call option 8600-8900 added 38.87 lacs OI with profit booking at 9000 and above strike prices. 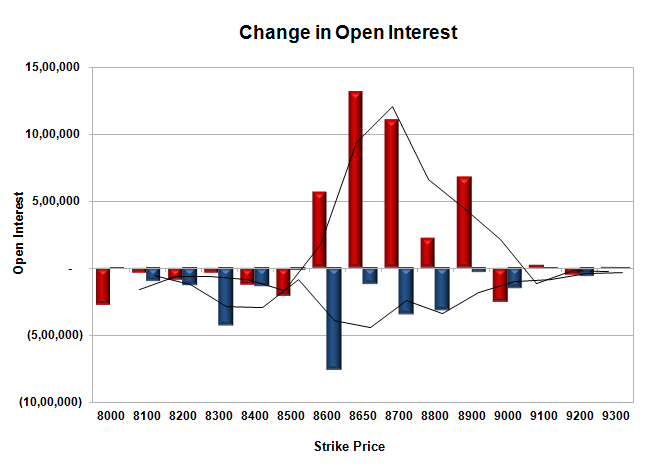 Put option did not add any OI with short covering at 8700 and above strike prices. Nifty Open Interest is at 1,81,63,500 down by 50,47,875, whereas next series added 57.32 lacs with decrease in price, most probably 100% roll-over with short build-up. 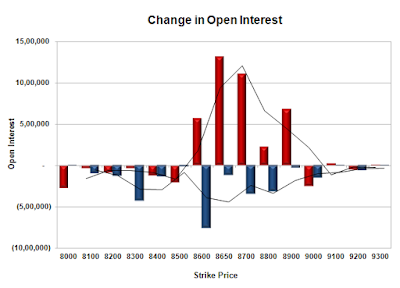 Bank Nifty Open Interest is at 19,13,960 down by 2,80,800, whereas next series added 4.35 lacs with decrease in price, most probably 100% roll-over with huge short build-up. FII’s sold 7293 contracts of Index Futures, which includes net 7660 contracts long build-up and 14953 contracts short build-up, with increase in net OI by 22613 contracts, includes 119324 longs to 126617 shorts for the day. FII’s Index future open contract as on date is 318488 Longs to 71551 Shorts, Net long 246937 contracts. 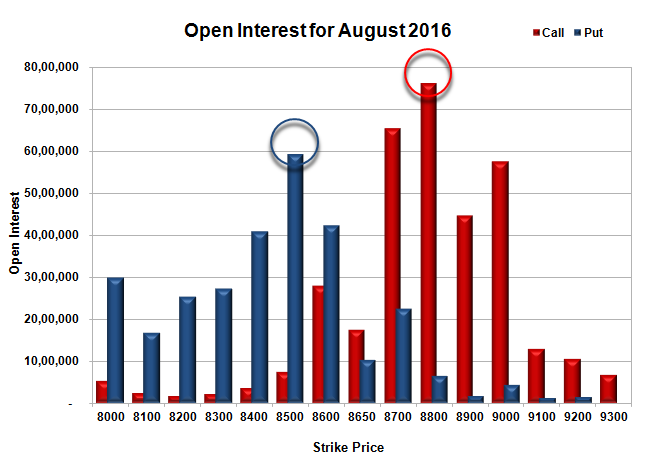 Initial support still at 8600, with OI of 42.31 lacs and below that at 8500 with OI of 59.25 lacs. Initial resistance at 8650, with huge OI addition of 13.16 lacs and above that at 8700 with OI of 65.44 lacs. 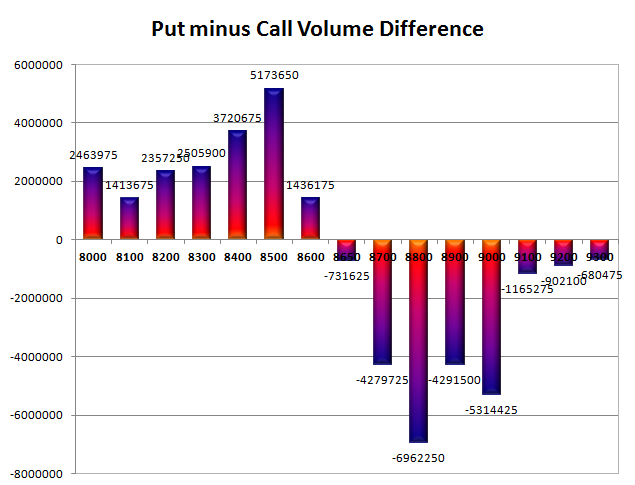 Day Range as per Option Table is 8584 - 8694 and as per VIX is 8565 - 8693 with 8643 as the Pivot. S&P Wealth Creators. Picture Window theme. Theme images by Jason Morrow. Powered by Blogger.